Biomedical Engineering - Applications Research, Inc.
For more information on any of the following items, please click it. CD PRINTING MECHANISM DESIGN AND/OR REVIEW Paper analysis of system for fabrication of compact disk printing system. Developed concept(s) for cost reduction and streamlining of system and reduction of number of parts. A variety of options were looked at. Overall effort resulted in about 30% cost reduction of the basic system. We believe other, more radical changes will amount to even greater cost reductions with an overall increase in performance. CHEESE MIXING EQUIPMENT DESIGN Designed and developed full (6-unit) line of cheese mixing devices (could be used for mixing most any product) for essentially breaking up clumps of product and mixing various components. CHEESE PROCESSING FACILITY Review of cheese processing plant equipment for problems with equipment. This effort involved a quite detailed look at the various items provided for production. Undue wear patterns caused foreign (metal) particles to be introduced into the finished product. Result was the product had to be rejected with significant financial loss to the processor. CONTROL SENSOR DEVICE THREAD FIT PROBLEM Review of line of parts for control sensors for European organization to determine source of problem involving fitup of their parts with components of competitors. Identified problem as lower quality control of competitors parts that allowed distribution of less than standard components. Submitted analysis and recommendations. COOLING FAN DESIGN Devised appliance motor cooling fan and housing configuration that lowered temperature inside of motor housing by nearly 18 degrees Fahrenheit as compared to the original design. This involved complete air flow experimental and numerical analysis of the air flow and shapes of the duct(s). We also introduced Toro to the concept of the airfoil shaped fan blade. Also, while at Black & Decker, cooling of motors was a constant issue. It is also an issue with almost any type of electronic enclosure. DAIRY PLANT LAYOUT Three or four different layouts for as many dairy and cheese processing facilities. In addition, created perspective, rendered, views of facility, showing recommended appearance changes. ECG CONNECTOR FOR CARDIAC ANALYSIS We designed a pickup connector that rested on the patient's stomach to connect 22 pickup points to the analysis software. 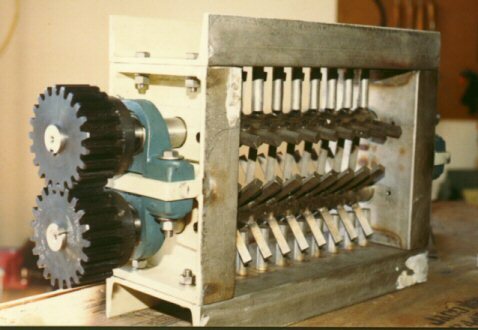 A unique feature was the clamping system that had an over-center snap action for simultaneous positioning and connecting of all points. We followed up the design by producing and supplying about 40 perfect prototypes to our client. ECG GROUNDING ELECTRODE CLAMP Design and analysis for ECG grounding electrode clamp for use with ECG heart monitoring equipment. This was a totally new concept which represented quite an improvement over anything then on the market. The most unique feature was that the connector had a self locking feature and was virtually impossible to shake lose because a direct pull would only make the connection tighter. However, a sidewise motion would cause it to release immediately. Formal report. ELECTRONIC CONNECTOR CRIMPING AND ASSEMBLY STATION (Carpel Tunnel) This unit was created to perform the operation of crimping the connectors onto the flexible tab ends of printed circuit laminations. This was created to eliminate the necessity of performing this difficult function by hand before it degenerated into a much more serious situation. This also served to speed up the process by at least two times. ENVELOPE FORMING MACHINE We designed an envelope forming machine to replace an existing, but very old, machine. The object was to duplicate the function of the existing unit but at approximately twice the speed. In addition, the setup for each individual envelope size took about 4-6 hours. By making the width of the carrier track adjustable with a hand crank, we were able to cut setup to about 20 minutes per size. Also, the output per unit time was about two times the original unit's. FISH COOKER Design and construction supervision of large scale tuna fish cooker. This involved all aspects of the design and construction. The most serious design consideration was to deal with the unequal coefficients of expansion of aluminum and stainless steel. All US and California FDA and OSHA standards applied here or included. FLAKE OR PELLET DRYING SYSTEMS Computer simulation Design or modification - including complete thermal analysis and computer modeling. These are large dryers used for the final drying of items such as Kellogg's Corn Flakes, Wheaties, Post Toasties and other familiar breakfast foods. 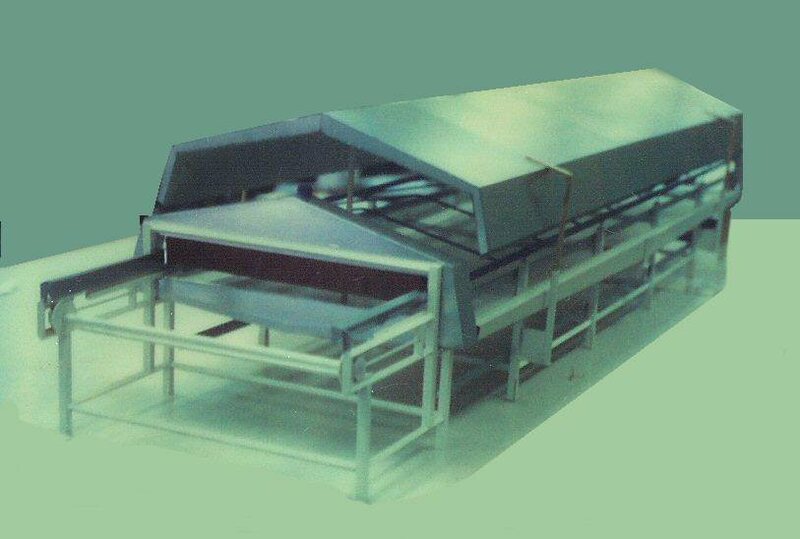 Flake and pellet dryers are simply large boxes, perhaps 10' to 12' square in cross section by as much as 50' long, with large perforated slat conveyors stacked inside. A proportionally controlled air stream is passed through the system, from bottom to top to dry the product. About thirty different units of various capacities. FOLDING HANDRAIL FOR ELDERLY AND HANDICAPPED As part of a study involving the negotiation of stairways for the elderly and handicapped, a concept was further developed for assisting the individuals to more safely climb up or down stairs. The device essentially amounts to a walker which is affixed to one side of a stairwell and makes it possible to secure one's position all the way up and all the way down a stairway so as to avoid the head-over-heel fall. This is presently installed in about 50 - 55 homes around the Twin Cities metropolitan area. As result of this work, and a couple of other projects, we have gained considerable expertise in the whole area of assistive technology related to safely moving people. We are also looking to license the involved patents to an interested manufacturer. FOOD DELIVERY CART - HOSPITAL (Carpel Tunnel) This effort came about as result of a review of the food delivery system at one of the local hospitals (HCMC). The object was to see if we could come up with a better system for hooking individual food carts onto an overhead monorail that was already in place. The existing system required a combination of high strength and agility to hook the carts on to the overhead rail. We came up with a system for accomplishing this by designing a new food cart with the mechanism for hooking built into the roof. The initial lift force was applied close to the center of gravity of the cart. Simultaneously, the lifting hooks were secured by a snap in (bayonet) lock. We built a quarter scale model unit that allowed us to work out bugs and demonstrate the concept perfectly. JOGGING BUGGY DESIGN REVIEW Initial project involved review of problems concerning Taiwan production of jogging buggies. Participated in discussion with the manufacturer. Later on worked with developing device for attachment of device to a bicycle (patented). MOLASSES MIXING TANK(s) Complete review and analysis of molasses mixing tanks. This included thorough stress analysis of the main structure and the 12 foot diameter circular perforated plates and welds. We took into account the cyclical (fatigue) nature of the loads as the tanks were regularly filled and emptied approximately 10 times daily (Arrow Tank). PALLETIZING EQUIPMENT Review, analysis, and redesign recommendations for a high volume soft drink can palletizing machine. Work include re-specification of components in such manner as to improve visual characteristics of equipment without compromising the actual structure. Use of proper components allowed actual slimming of the unit appearance while strengthening some of the critical components. 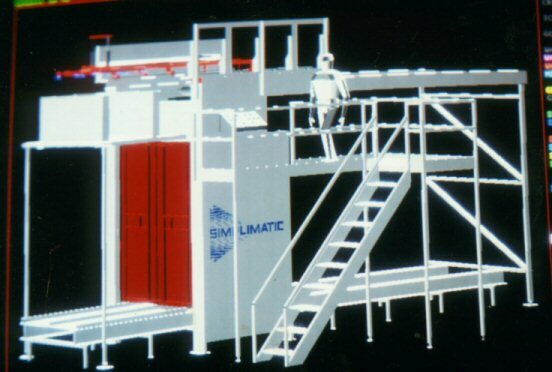 Graphics were developed around 3D computer models of the machines. PAPER SLITTER - HIGH SPEED Complete design/development of paper slitting, cut-off machine utilizing opposed circular knives. The purpose was to produce end papers for Toni Permanent Wave kits. Features included automatic paper roll tensioning system, flying cut-offs using rotary knives, plus stacking of product for placement into packages for shipment. PASSIVE MOTION EXERCISE MACHINE Design of machine for providing motion for a leg recovering from knee surgery. Project included initial simulation on computer, design of linkages, propulsion system, sourcing components and building of various stages of prototype (EMPI). Subject of article in Design News magazine. Led to Minnesota's Seven Wonders of Engineering Award. Follow-up project to this was analysis of linkage loads. PHOTO ETCHING Quite extensive photo etching process investigation and documentation of procedures, determination of level of education required, level of difficulty of overall operation, plus equipment required. Involved interview of various officers, employees, and suppliers. Formal report. PRINTED CIRCUIT LAMINATION (Carpel Tunnel Issue) This project involved designing a system whereby the clear layer could be applied to the PC substrate material in such manner as to eliminate serious reject (scrap) numbers and the problem of a curl being developed in the laminate due to the roll pressure. We absolutely solved both problems in such manner as to cause the client's main customer, a refrigerator manufacturer, to increase its orders of laminations by multiples. PROTOTYPE SHOP Organized Black & Decker's original prototype shop dedicated exclusively for use of the Lawn and Garden group. The object was to allow engineers and designers to construct very rough demonstration type models of concepts. This was to compensate for the extreme difficulty of obtaining that type of support from the main model shop and its competing demands. Partly as result of this, the Lawn and Garden group became one of the top performers (the top?) within the B&D engineering operation. SANITARY DESIGN APPLICATIONS Including full use of aluminum and stainless steel bolted and welded construction. Specific applications involving pellet and/or flake drying operations. Mostly involving internal ducted air systems over perforated slat conveyors. These all included supervision of construction. SILKSCREEN SYSTEM FOR COTTON BOOTIES This effort was to troubleshoot and repair an inoperable piece of automatic silkscreen application equipment for cotton "booties' worn by hospital patients. No manuals or repair instructions were could be located. The first thing we did was to run down all the wiring to locate all start and end points. Then we constructed a formal wiring diagram from the site sketches. Next, we constructed the ladder diagram of the complete system, streamlined the controls, corrected existing and potential problem areas, and tested the final system. STAIRWAY SAFETY STUDY AND FOR U.S. GOVERNMENT As part of the government sponsored development of a concept for assisting the individuals to more safely climb up or down stairs, a study was conducted, involving the negotiation of stairways for the elderly and handicapped, The device essentially amounts to a walker which is affixed to one side of a stairwell and makes it possible to secure one's position all the way up and all the way down a stairway so as to avoid the head-over-heel fall. This is presently installed in about 50 - 55 homes around the Twin Cities metropolitan area. As result of work on this study, plus other efforts, we have gained considerable expertise in assistance technology related to safely moving people. TISSUE EXPANDER INVESTIGATION Complete review of tissue expander characteristics for insurance company prior to authorization for payment of claim. This included leak testing of samples provided, observation of pump-infusion system, and review of fabrication manual for the expanders. Object was to identify where an obvious cut occurred in the tissue expander surface. (St. Paul Companies). ULTRASOUND SUPPORT ARM (Carpel Tunnel Issue) We were asked by the ARIC study group (Athlerosclerosis Risk in Communities) to develop a mechanism that would eliminate the serious discomfort felt in the arms of the technician operating the ultrasound device after a full shift of lifting and holding the sensor. Multiples of these were designed and made for North Memorial Hospital and a North Carolina hospital when some of its employees spotted it on a visit to Minnesota. One of the additional benefits of this device was that it held the ultrasound transducer so still that it cut the number of photos required to get an acceptable shot, from 4 or 5 per view, to 1 or two and cut the time in half for a typical set of procedures. We'd be pleased to provide these units to any hospital in the metropolitan area for a very reasonable cost. We might also be interested in working these units into a product line for a medical products company that knew the market. We also have some ideas for even better versions. ULTRAVIOLET LIGHT CURING SYSTEM Safety review of light curing system for adhesive joining of various components. Included analysis of safety issues such as pinch points, eye damage potential, and manual problems. Recommendations were made for changes to both equipment and manual with ultimate goal to obtain U.L. approval.